"Traditional” wine barrel bungs are precision molded to fit all U.S. and French barrels. 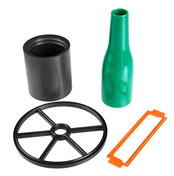 Our solid barrel bungs are manufactured from FDA grade/food grade silicone for safe and reliable sealing in any application. They are durable, lightweight, and easy to install and remove. Custom wine barrel bungs are available to meet your unique specifications (see below). Contact us to discuss custom solid wine barrel bungs for your application. Our solid silicone wine barrel bungs are manufactured in stock U.S./French size (55mm top x 45mm base x 43mm height). For specialized applications, we can provide custom wine barrel stoppers in nearly any size you may need. “Natural” color (translucent white) is standard; solid barrel bungs can also be provided in custom colors and/or with custom printing, as your application requires. We also offer solid wine barrel bungs with top grip lip, hollow wine barrel bungs with or without top grip lip, and wine barrel bungs with 3/8” thru-holes. What is Silicone & Why is It Used for Bungs? “Silicone” is the general name for a family of polymer materials that includes any synthetic compound that consists of repeating units of siloxane. The most common form of silicone, silicone rubber, can be found in a huge array of applications. Silicone rubber is non-reactive, stable, and resistant to fungal growth. It can also be used harsh environments and extreme temperatures (-75° to 450°F/-60° to 232°C), as it doesn’t become brittle in subzero conditions and maintains its dimensional tolerances at high temps. Silicone rubber’s beneficial chemical and mechanical properties, and the ease of manufacturing and molding this material, make it perfect for wine barrel bungs. Ace Seal uses specialized, FDA-approved food grade silicone for all our barrel stoppers. Contact us to place an order or to learn more about our solid silicone wine barrel bungs.